Subscribe to our newsletter and get notified when we list new parts. 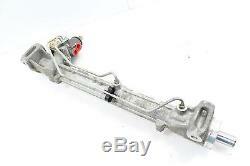 AUDI A4 B8 2.0 T - POWER STEERING RACK GEAR. Location: 97A Sku Number: 95180 Stock Number: AA0243 OEM Part Number: 8T1422065P. Make: AUDI Model Name: AUDI A4 Year: 2009 Color: Meteor Grey Pearlescent Exterior Color Code: X5 / Z7H Color: Sabre (Black) Interior Color Code: GD Engine: 2.0L TURBO Engine Code: CAEB Transmission: 6-SPEED AWD AUTOMATIC Transmission Code: KXT. This part comes as shown in the picture(s). YOU are responsible for part fitment on your vehicle. AUDI A5 08-09 Power Rack and Pinion (Quattro) AUDI A4 09 Power Rack and Pinion SW, Servotronic (opt 1N3) AUDI S4 10-12 Power Rack and Pinion Servotronic (opt 1N3) AUDI S5 08-09 Power Rack and Pinion AUDI A4 10-12 Power Rack and Pinion Servotronic (opt 1N3) AUDI S5 10-12 Power Rack and Pinion Servotronic (opt 1N3) AUDI A4 09 Power Rack and Pinion Sdn, Servotronic (opt 1N3) AUDI A5 10-12 Power Rack and Pinion Servotronic (opt 1N3). YOU ARE RESPONSIBLE FOR ITEM COMPATIBILITY AND FITMENT. Part numbers are provided for most all items. Genuine OEM Parts - All the parts we sell are OEM, unless stated otherwise. They aren't cheap knock-offs or aftermarket. Indoor Storage - All parts are stored indoors and away from the outdoor elements. Cleaned & Tested - Our parts are cleaned and tested, ensuring you're getting a quality part every time. Remember You Are Covered By Our 30-Day Guarantee! Most all of our parts are USED. All of our parts are found to be in good working condition before they are listed for sale (Unless stated otherwise). All of our parts are stored indoors. Interior / Exterior / Cosmetic Parts. Most of our parts listed are in good condition (unless stated otherwise) but please keep in mind that these are used parts, not new and may show some signs or normal wear. We try to provide a part number whenever possible to help you do so. We will try our best to help you out. Side of the vehicle and. Depending on location and item size. The 30 day period starts when you take possession of the part. Wolf Auto Parts 127 6th Street South, Waverly, MN 55390. 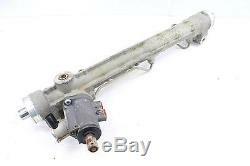 The item "AUDI A4 B8 2.0 T POWER STEERING RACK GEAR" is in sale since Friday, August 28, 2015. This item is in the category "eBay Motors\Parts & Accessories\Car & Truck Parts\Suspension & Steering\Steering Racks & Gear Boxes". The seller is "wolfautollc" and is located in Montrose, Minnesota. This item can be shipped worldwide.